Aaron H. Jones built this house, which was soon sold to the Presbyterian Church for use as the manse. The Reverend Dr. Joseph Ruggles Wilson and his family were the first occupants of the house. One of his children was Thomas Woodrow Wilson, who would go on to become the 28th President of the United States. Wilson remembered his time in Augusta fondly. 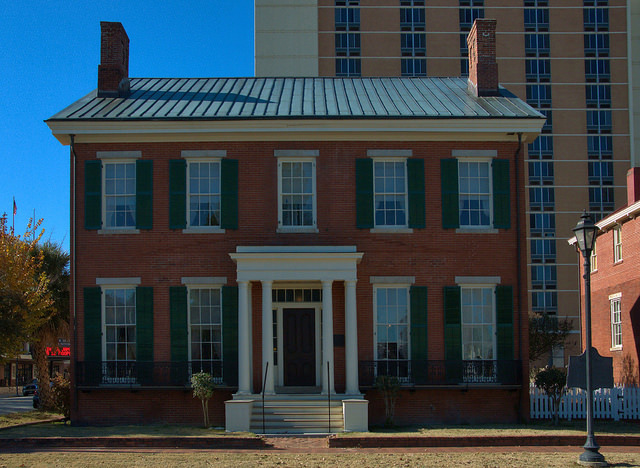 The house is now owned and operated as a museum by Historic Augusta, Inc. Unfortunately, like the adjacent Lamar House, the Wilson House is dominated by an unattractive modern highrise. That’s a fact apparently not lost on Historic Augusta, as the highrise has been cloned out of their image of the house. It would be nice for Augusta to look into removing the offending structure at some point in the future. You really hit the jack pot with your trips to Burke and Richmond Counties. There much Georgia beauty and history abound. Makes one proud to be from Georgia.